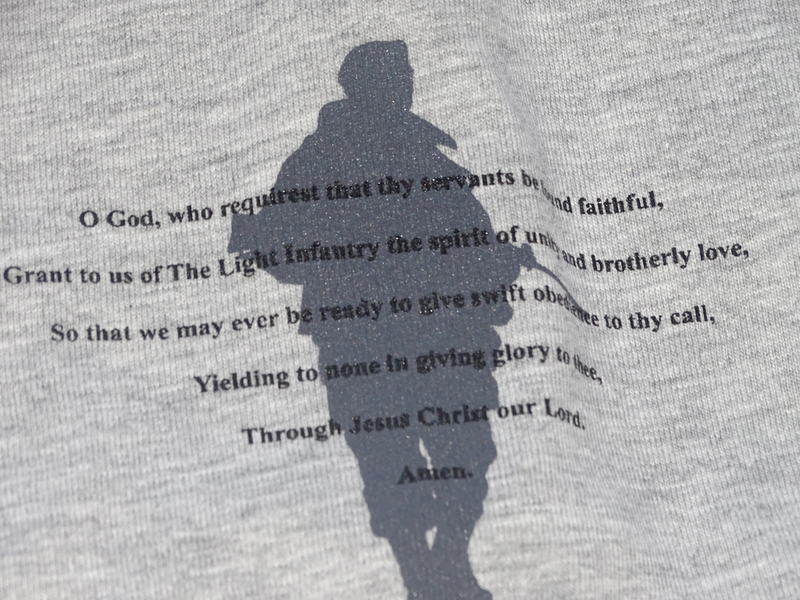 The 1LI Tour has been set up in an alternative colour than our usual bottle green and has been specifically added to the Stores to help raise valuable funds to keep the 1LI Association operational, for as long as it is required by battalion members. 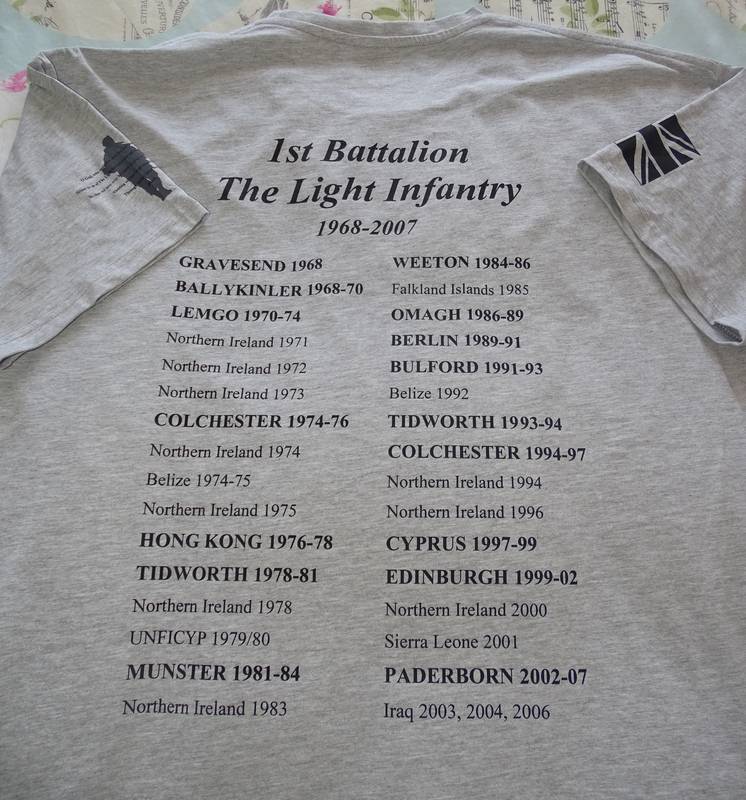 The Tee is Heather Grey in colour and has the 1LI Logo printed in full colour to the left chest (the first 100 only have the word Association on), the back has the main postings\/tours printed in black, the left arm has a printed grey silhouette of a soldier on patrol with the Light Infantry Collect in black over the top of it and on the right arm is a dark grey\/black printed Union Jack. An initial order for 100 was placed with our supplier and if proved to be successful, stock will be reordered as and when required. Reactive Dyed, Crew Neck, Taped Shoulder to Shoulder, Twin Needle Stitching on Neck & Shoulders. 3XL = 50\/52\" Chest, 4XL = 54\" Chest. *Please remember that the above sizes are only a guide. P&P - You will see upon Checkout that we have had to cost the postage as a Small Parcel due to the different sizes and weights. The smaller sizes and some of the mid sizes may well go as a Large Letter (not all) with the remainder being posted as a Small Parcel. We had the same issue with the 50th Tee and this time we have made sure that the Tee price reflects the mixture of postage rates to be fair for all. 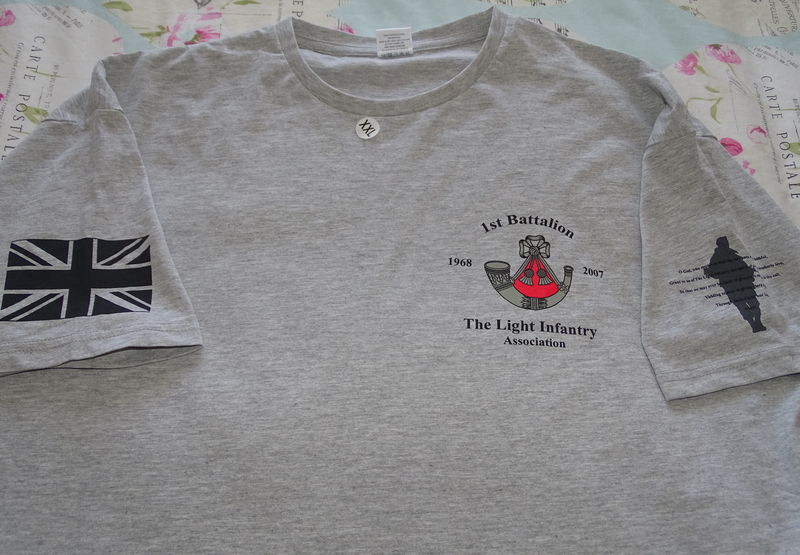 The Tee is Heather Grey in colour and has the 1LI Logo printed in full colour to the left chest (the first 100 only have the word Association on), the back has the main postings/tours printed in black, the left arm has a printed grey silhouette of a soldier on patrol with the Light Infantry Collect in black over the top of it and on the right arm is a dark grey/black printed Union Jack. 3XL = 50/52" Chest, 4XL = 54" Chest. Any single orders from size Small to Extra Large that can be posted as Large Letters will also be upgraded to 1st Class as part of this action.